Are you looking for a big 4 bedroom home located in a quiet street? With a SHED? Better than new, perfectly presented minutes to shopping centres, schools and doctors. 4 Bedrooms, master extra-large WIR/ensuite. Central well-appointed kitchen, 2 livings areas. Massive outdoor tiled all weather patio, perfect for large family gatherings. 5mx4m fabulous shed for boat, caravan or to house those expensive “boy toys”! 3.2kw Solar... The extras here are amazing. Perfect starter, investment or retiring. For those searching for a quiet lifestyle. CHECK OUT THE NEW EXCITING FLOORPLAN IN THE VIRTUAL TOUR BUTTON!! Our home is close to everything. Bunnings at North Shore is less than 5 minutes away as is the North Shore Shopping Centre. Deeragun shopping Centre nowadays has everything from major supermarkets to butcher, fresh farmers’ markets, Doctors, Vets, Chemists, Optometrists, Pathology, Dentists, numerous Gyms, Supercheap Auto, and every take-away outlet you can think of as well as Restaurants, Beauty Salons, Hairdressers. 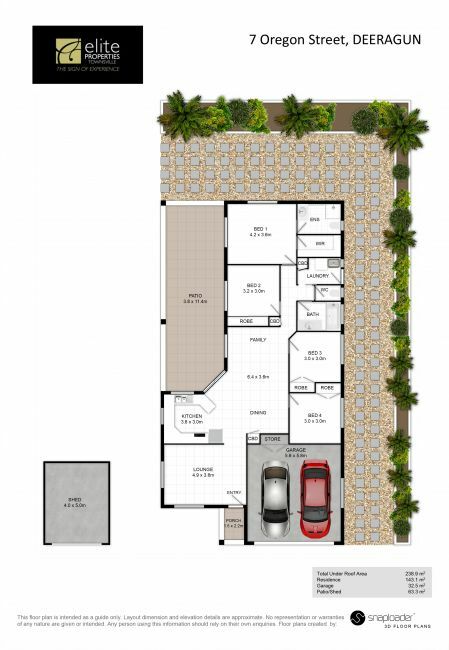 Oakdale Heights is a boutique suburb of only 369 quality houses with 700+sq metre fenced blocks. Concrete walking track with gardens, wooden benches, and children play areas along the way. The suburb is located at the base of a hill; so many streets have elevated blocks catching beautiful sea breezes. A seven seater lounge suite facilitates enjoyable tv viewing and discussions with guests. An open-plan kitchen/dining/family room is central to our requirements as we both hate being ‘walled’ in. Guests can converse with the cook while meals are being prepared. The dining and family room areas suit us as we combine the two. Lots of windows and a sliding glass door opens onto the deck. These facilitate a cross flow of ventilation. Most days with the breezes and cross flow ventilation, we use only the stainless steel fans. These are extremely effective and very efficient with the 3.25kw solar panel system on the roof with the 5kw capacity Inverter. The master bedroom is large and easily accommodates a King sized bed with ample space around the bed, dresser and side tables. There’s room for a comfortable corner reading chair if desired without the room being ‘cramped’. A large window at the back of the room gives a view to the garden and Parent’s Retreat’ behind the house. This Retreat is also fenced & gated off from animals if desired and gives a lovely view of ‘the hill’. The laundry opens to the side of the house with the garden bed running the fence-line. Access to the outdoor collapsible clothes line is via stepping slabs to the back of the house and the Parent’s Retreat area. It has a single basin and underneath cabinet, room for a large washing machine and a two-door linen cupboard. For the man of the house – a 5m x 4m Man’s Cave is situated at the front and side of the house in the same colour scheme. It has a single roller door to the front and a single door to the back which is lockable. Not far outside this shed is the veggie garden which sits within a fenced area so that animals cannot invade the veggies unless allowed into this area. The property is surrounded with five foot panel fencing which has been painted the same colour as the front roller doors. This helps preserves the timber as well as enhancing the appearance of the property. All the garden beds structures have been painted the same colour. In recent weeks the Townsville property market has seen an increase in buyer demand in this price range. This family home centrally located offers excellent value with loads of extra features; make sure you don’t miss out. form below and we will get back to you as soon as possible!